<u><b>Features & Equipment</b></u>:<br><br> <u><b>Hull & Deck</b></u>: <br>Anchor light, Anchor storage, Boarding ladder, fold down 3 step, Bow and stern eyes - stainless steel thru bolted, Cleats - stainless steel thru bolted (5), Exhaust vents, Garboard drain plug, Hardware - stainless steel, Integrated fiberglass swim platform, Navigation lights, Rub rail - heavy duty, Ski tow eye - stainless steel, Windshield - curved walk thru center with stainless steel support braces.<br><br> <u><b>Cockpit</b></u>:<br> Beverage holders (6),Bow seating, Canvas - sport top - Sunbrella, Courtesy lights, Glove box - lockable, Hand holds - stainless steel, Insulated engine compartment, Seating - back to back fold down lounge seats and hi-low aft jump seats, Ski locker, Snap in cockpit carpet, Stereo - AM/FM CD player with 4 weather resistant speakers, Storage - below bow seating, Storage - cockpit side panels, Storage - floor, Storage for sport top.<br><br> <u><b>Mechanical</b></u>:<br> Accessory plug - 12 volt, Audible engine alarms (oil, water), Auto bilge pump with float switch, Battery box, Electric bilge blower, Fuel tank with anti-siphon valve and electric sending unit, Full instrumentation mounted in wood-grain panel - fuel, oil pressure, speedometer, tachometer, voltmeter, water temperature, and trim, Horn - flush mount, Ignition interrupter with safety lanyard, Depth sounder, Power trim and tilt, Propeller - aluminum, Rocker switches - weather resistant, Side mount throttle lever with trim switch, Steering wheel with tilt and power steering, Anti-corrosive system (zinc plate), Bimini top, Bow cover, Cockpit cover, Trailer - galvanized with brakes.<br><br> <u><b>Notes</b></u>:<br> Has a dual battery switch- ready for installation of a second back-up battery. Boat is protected when not in use by a separately purchased overall single cover in addition to the two snap-on covers. Has an extended transferable warranty on all Volvo engine related parts, with a $35 deductible per occurrence. Warranty expires in May of 2009. The hull comes with a limited lifetime warranty, a portion of which may be transferable to the second owner. 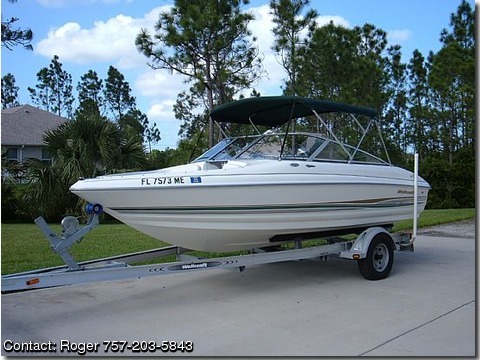 It is basically a single fiberglass construction that is manufactured using a patented closed-mold system, which eliminates traditional wood stringers and floors -- a fiberglass floor is molded right into the hull of the boat -- offering improved structural integrity, uniformity and durability.<br><br> <li><b>Price is negotiable.